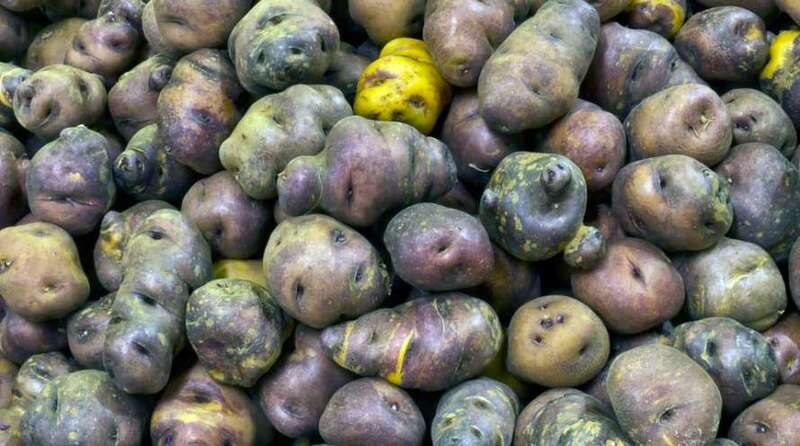 “Papas Antiguas de Canarias” means the tubers of potatoes belonging to the species Solanum tuberosum and Solanum chaucha, introduced in the Islands before the 20th century. The cultivation of this tuber in Europe began in our islands around the sixteenth century, with the entry into the archipelago of seeds from Latin America. We thus become a small laboratory for new crops. The old potatoes have their redoubt in the north of Tenerife, in the payment of Icod el Alto, where the tuber was cultivated for the first time (according to citation in a written Viera y Clavijo in the year 1799). The different varieties were adapted to the conditions of the islands and their steep orography, managing to conserve until today, thanks to the important role of the Canarian woman, responsible for keeping and caring for the seeds. This legacy, with protected designation of origin (the first of a tuber in Spain and the second in Europe), is cultivated in volcanic areas of lowlands located under 1,200 m. above sea level and on the islands of Tenerife, La Palma and Lanzarote. The nutritional value of the potato changes according to its mode of preparation. Although it barely has calories, in 100 grams of potatoes are multiplied by 4 if we take them fried (290 kcal), instead of wrinkled (80 kcal). It should be noted that in order to obtain the full effect of the fiber, potatoes with peel must be consumed. The insoluble fiber comes from the skin, that is why the potato should not be peeled, this fiber contributes to the expulsion of the waste helping to have regular bowel movements, thus reducing the risk of hemorrhoids and digestive inflammations. • Besides to calcium, iron, vitamin C, vitamin B6, vitamin D, phosphorus, magnesium and potassium.